I’m highly opinionated (and not afraid to admit it,) middle aged, politically and for the most part socially conservative, and from time to time I sincerely wonder who abducted me and sent this old bitty to occupy my space. Most of my professional life (save for three months from hell working as a bank teller for minimum wage with a pack of snitty old bitties) has been spent in the automotive industry. I’ve been a parts driver, I’ve worked parts counter, I’ve been a parts manager. I’ve also been a service advisor and then a service director- in various dealerships across Central Ohio. I have a degree in business management so go figure, but eventually the whole management thing with the sixty to eighty hour weeks- not to mention the stress of dealing with psychotic customers, whacked out dealership owners, and clueless general managers got to my health. For the past ten years I’ve been selling parts to dealers from a distribution warehouse. The stress level is a lot lower and they throw me out after forty hours a week. I live in a world I refer to as “Whine Country.” Three minutes with my esteemed spouse and even the most patient of saints will exclaim, “What a whiner!” Then again my household is especially suited for those with high maintenance and special needs. I was raised by a very old school Catholic mother who believed in getting purgatory done with here on earth. I am not Catholic (became a Lutheran many years ago) and I don’t believe in purgatory, but I guess the old Catholic guilt and love of suffering lingers on. I guess this is why I put up with Jerry and his whining, excessive love of Natty Lites, lottery and penchant for leaving everything messier than he found it. Somebody has to. In my mind and heart it’s still 1985 or thereabouts. The music was better and so were the clothes, but I’ll pass on the 80’s hair. I had enough of spiral perms and Aquanet back then to last me a lifetime. 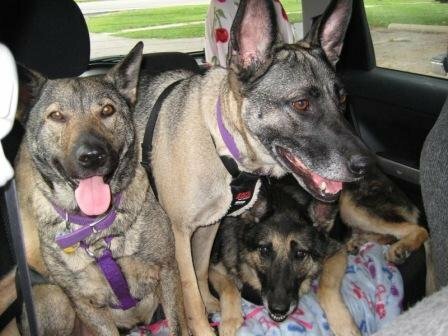 These are my dogs from left to right: Lilo, a Chow/German Shepherd mix, Clara, a Belgian Malinois/German Shepherd mix, and Heidi, a purebred German Shepherd. Lovely Miss Heidi died last October at the age of 12 years due to complications from advancing degenerative myleopathy (a common neurological disease in GSDs) Of course the Fickle Finger of Fate would not let us go with only two dogs. Sheena came to us in mid-November. 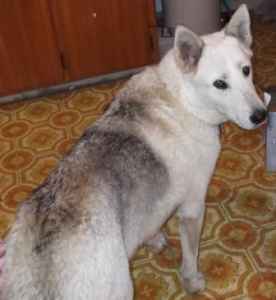 She is a three year old GSD/Husky mix- a puppy in a 70# body. If you’re going to have dogs, have big dogs. I can’t deal with the “yappy cat” variety dogs. I want a dog that can protect me, or at least who can make people think twice about screwing with me. Protection breeds rule for that very reason. Sheena, like Heidi before her, is perfectly harmless, but Clara is not. The Malinois in her lineage is very evident. I regard my dogs with higher esteem than many people I know. Perhaps this is a testament to the virtue of dogs, or a testament to the ongoing depravity of man. I will say John Calvin was right about the total depravity of man. Apart from the grace of God we humans- and I do not hesitate to include myself in this category- are pretty nasty entities. Dogs I can trust. With dogs what you see is what you get. As far as humans go, Ronald Reagan used to quote a Russian proverb, “Trust but verify.” I don’t completely trust anyone (save God alone) , including myself. I guess that would mean I’m a bit of a misanthrope. It’s sort of a love/hate thing. I love people but hate the nasty things we do. I abhor stupidity where ever I find it, though I do try to see the humor in it all the same. I look at humanity with a cynical eye if for no other reason than I know just how evil we humans can be. I used to have my blog on Yahoo (access it here) but it got too complicated to add pictures and it was too awkward to use after they got rid of the 360 app. The ’80s were my favorite decade for music, it rocked. Your dogs are beautiful, so glad you chose to rescue. I must say I agree with you about dogs.Now I have a child,I love him as much as, but not more than my dogs. Yes, dogs smell better, cost less and will never call you foul names to your face.